These two ancient fragrances have been revered for over 5,000 years. Renowned as the gift of the Magi to the baby Jesus, and even more valuable than the gold they brought, frankincense and myrrh offered a multitude of medicinal qualities in addition to their heavenly scents. As with all our soaps, Herbaria does not use imitation fragrances. To make this soap, we add genuine steam-distilled essential oils imported from Somalia. These costly oils account for the bar’s premium price. The frankincense is derived from a resin of the Boswellia sacra tree (also known as B. carteri); the myrrh is a resin from the Commiphora myrrha tree. Finely ground Rhassoul clay, from the Atlas Mountains of Morocco, is marbled into this bar to provide a mineral-rich toner. 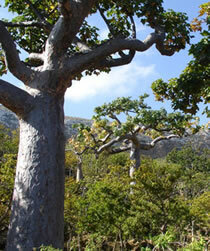 Shea butter, also from Africa, moisturizes and protects your skin. The homeopathic literature claims that frankincense is spiritually healing and calming, and also skin-regenerative, antiseptic, anti-carcinogenic, anti-inflammatory and an antidepressant. It can be especially beneficial to the respiratory system for coughs, bronchitis, colds, and flu. We make no claims—we simply believe you will find this soap a royal treasure. 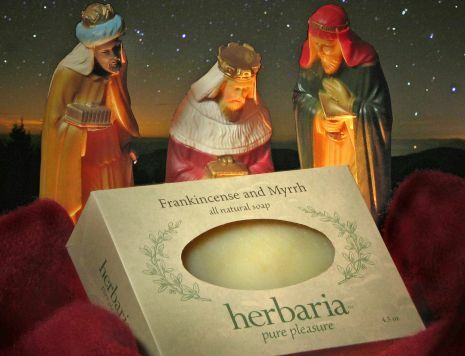 Essential oil of frankincense trees gives this soap its legendary aroma.